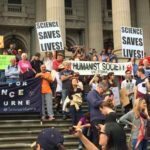 News Archive 2017 - Humanist Society of Victoria inc.
28 Nov 2017 – The Humanist Society of Victoria congratulated the International Campaign to Abolish Nuclear Weapons (ICAN) which, having started in Melbourne ten years ago, instigated the UN Treaty on the Prohibition of Nuclear Weapons that was passed on 7 July 2017 by a vote of 122 to 1 – while the nuclear nations and Australia absented themselves. This significant achievement has earned ICAN the Nobel Prize for Peace, 2017, to be awarded on Human Rights Day 10 December. The treaty will come into effect when fifty nations have ratified it. On your behalf, the HSV committee has endorsed an open letter from ICAN to the prime minister, urging Australia to sign and ratify the treaty. 24 Nov 2017 – It was with great relief that the Victorian government’s Voluntary Assisted Dying Bill passed the more conservative upper house on Wednesday 22 November 2017. The now amended Bill will go back to the lower house for its final approval, before VAD can become legal in Victoria. Even then dying people will not be able to access this most humane option, if they so choose, until mid-2019. In the Legislative Assembly (lower house), the bill passed 47 votes to 37, while in the Legislative Council (upper house), the bill passed 22 votes to 18. 20 Nov 2017 – On 19 November 2017, Mary Bergin, OHA, represented theHumanist Society of Victoria at the Remembrance Day ceremony at Parliament House (Vic) for victims of Road Trauma and all those impacted by it. During the ceremony, Mary joined Bishop Peter Danaher (Victorian Council of Christian Churches), and Murray Davies, (Faith Communities Council of Victoria) in lighting memorial candles. 6 Nov 2017 – At the time of the Annual General Meeting, the Voluntary Assisted Dying (VAD) Bill had been debated at length in the Victorian Legislative Assembly. It was passed unamended after a conscience vote and was awaiting debate, with proposed amendments, in the Legislative Council. A crucial milestone. The Dying with Dignity Victoria (DWDV) president, Lesley Vick, acknowledged the work of many people in the campaign to lobby politicians and generally publicise the legislation, including Harry Gardner, a long-time HSV member. In November 2016, the Medical Treatment Planning and Decisions Act 2016 was passed. As a result, from 12 March 2018, Advance Care Directives will be statutory documents. Mention was also made of Dr Rodney Syme, having received the award of Australian Humanist of the Year (AHoY), 2017. The Rodney Syme Medal for Distinguished Contribution was awarded to the Hon. Fiona Patten of the Reason Party, for her skilful work in shepherding the VAD Bill through the parliamentary procedures. 1 Nov 2017 – HSV congratulated the International Campaign to Abolish Nuclear Weapons (ICAN), which, having started in Melbourne ten years ago, instigated the UN Treaty on the Prohibition of Nuclear Weapons that was passed on 7 July 2017 by a vote of 122 to 1 – while the nuclear nations and Australia absented themselves. This significant achievement has earned ICAN the Nobel Prize for Peace, 2017. The treaty will come into effect when fifty nations have ratified it. On your behalf, HSV committee has endorsed an open letter from ICAN to the prime minister, urging Australia to sign and ratify the treaty. 1 Nov 2017 – Gladys Folie joined the HSV in 1972 and for the next three decades she was a very active member. She was a committee member in 1973, 1974 and 1987–89. During the later term she was an interim president. Glad was an organiser of social events and well into the 1990s she came to nearly all HSV activities, including regularly helping with the VH mailouts. For her many years of involvement, Glad was made a Life Member in 2013. 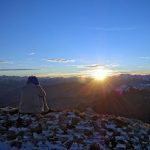 Glad was a practical, no-nonsense sort of person, and it comes as no surprise that she has willed her body to medical research. For many years, Glad lived in a retirement village and it was only a few months ago that she moved to a nursing home, where she died. Humanist sympathies to her children, Meg, Brian and Ralph, and the grandchildren. 1 Oct 2017 – Mira and David Peck, friends of HSV and members of Capital District Humanist Society (CDHS) in New York State, send their greetings and some local newsletters. These highlight some of the activities and campaigns that CDHS members are involved in. In recent months members have heard talks on ‘Domestic Violence’, ‘Gun Control’, ‘End of Life Choices’, ‘Humanist Funerals’, ‘Christian Right Influence on Children’s Literature’, ‘Preparedness for Terrorist Attacks’ and ‘Responses to Catastrophes’. Examples of CDHS activities include running a book group and volunteering in shelters for homeless families, in after-school programs, along with delivering meals on wheels. They also collect donated household goods and food each month. The CDHS has been running decades-long action to defend the separation of church and state, and this continues at a national level. Prayers in schools, at public gatherings, etc., were declared unconstitutional and have been abolished in most States. So CDHS has been involved in successful actions in Supreme Courts in various States to eliminate so-called ‘captive schools’ that are run by religious groups. 1 Oct 2017 – The British Humanist Association established the Humanist Pastoral Support service to visit and support patients (on request) in hospitals and other health services. In Victoria, ‘Pastoral’ has been replaced by ‘Spiritual’. The accredited training agency in Victoria is willing to train Humanist volunteers. Lyndon Storey, President of Council of Australian Humanist Societies (CAHS), has been a Humanist Volunteer Chaplain at a Canberra Hospital for the last two years. He stimulated HSV to get organised for this activity and addressed the HSV members’ discussion group on 13 August 2017, when several members expressed interest. We are pleased to say that so far seven people have committed to do the two days training, following which there will be a further half-day when participants individually do work experience under supervision, in a hospital or other health facility. The two days training is on Tuesday 21 and 28 November 2017 and will be held at Ros’s home in Balwyn. There is no cost involved for the training and HSV will provide a light lunch on the training days. More participants are welcome! For further information or questions, please contact John Russell by email at jr38@optusnet.com.au or phone on 0478 365 956 or (03) 9846 3989. 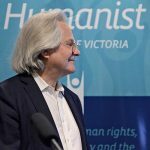 31 Mar 2017 – The Humanist Society of Victoria is hosting the 52nd Annual Convention of the Council of Australian Humanist Societies. Have you booked for this exciting Humanist event?